by Sen. Jim DeMint, Senate Conservatives Fund: Shortly after 5 o'clock last night, Governor Crist announced he was leaving the Republican Party to run as an Independent. The Republican primary in Florida wasn't expected to conclude until the middle of August, but Governor Crist conceded that race yesterday to Marco Rubio -- four months early. In one of the most dramatic reversals in American politics, Marco Rubio launched from a 30-point deficit to more than a 20-point lead in the Republican primary contest with Governor Crist. Marco's clear and compelling message for conservative principles drove him from near obscurity to one of the most exciting and well-known leaders in the country. The good news is that a true conservative will represent Republicans on the ballot in November. The bad news is that the race isn't over. Charlie Crist has decided to do whatever it takes to win the election. For Crist, running for public office is entirely about him, not about what's best for the country. Crist supported and campaigned for President Obama's $787 billion stimulus bill. Rubio opposed President Obama's stimulus bill and supports serious measures to cut federal spending. Crist signed a pledge to oppose federal income tax hikes but recently broke his pledge to oppose state tax hikes. Rubio signed a pledge to oppose federal income tax hikes and has consistently opposed tax increases at the state level. Crist said he had "mixed emotions" about the $700 billion Wall Street bailout because he believed it could "create stabilization." 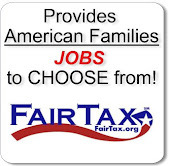 Rubio opposes government bailouts and believes tax cuts for individuals and businesses will grow the economy. Crist supports a "cap and trade" policy that will increase taxes and raise energy prices. In fact, he signed a bill to create a cap and trade system in Florida. Rubio opposes President Obama's "cap and trade" scheme. Crist supported the McCain-Kennedy amnesty legislation that would have rewarded illegal immigration. Rubio opposes amnesty and believes we must secure our borders and enforce our immigration laws. Crist opposed a waiting period to protect unborn children and said he was "pro-choice" when he ran for the Senate in 1998. Rubio is 100% pro-life, supports a waiting period to protect innocent unborn children, and has not waffled on the issue. 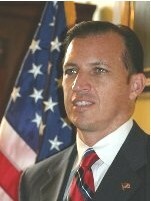 Crist appointed two liberal judges to the Florida Supreme Court, including one endorsed by Planned Parenthood. Rubio supports only strict constructionist judges who won't legislate from the bench. The choice in this race could not be more clear. Let's finish what we started here by making sure Charlie Crist doesn't use the millions he raised masquerading as a Republican to win this race. Tags: Europe, Bailout, Stop the Bailouts, Mike Pence, Cathy McMorris Rodgers, Obama Administration, U.S. Treasury Secretary, Tim Geithner, Greece, European Union, American taxpayer To share or post to your site, click on "Post Link". Please mention / link to the America's Best Choice. Posted by Bill Smith : Post Link --> 12:39 PM 0 Comments - Share Yours! Florida Gov. Charlie Crist said today (Thirsday 4/29) that he is leaving the Republican Party and will seek a seat in the U.S. Senate as an independent. Crist began his campaign as the dominant candidate in the race, but he has steadily lost ground, in GOP polls and fundraising, to former state House speaker Marco Rubio. Posted by Bill Smith : Post Link --> 8:21 PM 0 Comments - Share Yours! HEALTH NEWS FLORIDA — Only hours after the Florida House and Senate voted to "opt out" of the new federal health law, the top U.S. health official said Thursday night that will not be permitted. Without mentioning any particular state or going into detail, Health and Human Services Secretary Kathleen Sebelius said that state and local officials can vent all they want about a so-called "federal takeover" of health care. But they cannot deny their citizens access to its benefits or requirements, she told the Association of Health Care Journalists. “They may want to opt out, but they don’t get to opt out all of their citizens who want and need health care,” Sebelius said. . . . At least 30 states have passed state constitutional amendment legislation similar to that approved by the Florida Legislature, according to theNational Conference of State Legislatures. by Rick Manning: Al Gore may have another cause to champion. In the wake of some whacky climate “scientists” declaring that the “thawing” Icelandic ice cap could cause future serious volcanic eruptions due to the reduction of glacial mass that is keeping the earth’s magma suppressed, the Daily Mail in the UK came up with an even crazier explanation of the seeming spate of earthquakes around the globe. Scantily clad women. That’s right. Bikinis make the earth move. I’m not talking Carole King lyrics here, but actual, real live shorts and halter tops. Well known Iranian earthquake predictor, President and resident mad man Mahmoud Ahmadinejad has predicted that a quake is certain to hit the capital of Tehran, urging residents to relocate. Mahmoud may have misread the geological tea leaves when it comes to predicting what is likely to make the ground move in Tehran, but that is another topic. Now, that explains the constant threat of earthquakes in California, but somehow I would guess that they were pretty bundled up during the Anchorage, Alaska quake on March 27, 1964. It is suspected that Mahmoud and HKS have been taking lessons on the earth’s geological foundations from noted intellectual Congressman Hank Johnson. Johnson, you will remember, last month worried that Guam might capsize in Congressional questioning of the Admiral in charge of the entire Pacific Fleet. That brings us back to Iceland - an island, using Johnson’s unique island flotation theory, even more in danger of suffering Guam’s feared fate with Mt. Lotsarandomletters billowing tons of ash into the air. Clearly, as all that lava and ash flows upward, the bottom of the island gets lighter, exponentially increasing the chances of it tipping over. All of which goes to show you that whether you are in Europe, Tehran, Washington, DC or even Tennessee, if you just turn in enough box tops, you too can get a hockey stick shaped diploma certifying your expertise on the weather and other natural phenomena. And it comes with a handy decoder ring too. Rick Manning is the Director of Communications for Americans for Limited Government and the former Public Affairs Chief of Staff for the U.S. Department of Labor. 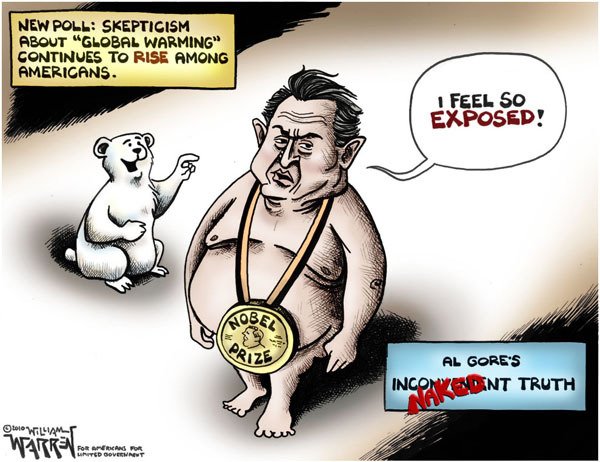 Tags: William Warren, political cartoon, Al gore, naked, truth, global warming, Rick Manning H/T ARRA News Service. Thanks! John Allison, III, Editor, America You Asked for It! : ...even with the mainstream media as a willing accomplice in their attempt to mislead the American people. The Democrat party has long claimed to represent the "common man" while painting conservatives as being "in-the-pockets" of big business, or Wall Street. Liberals and their Jackass party claim to stand for constitutional freedoms. You know, like freedom of the press and free speech. All the while, they claim conservatives constrict the rights guaranteed by our founding documents. And the loony left loves to paint conservatives as rabid, violent, hatemongers filled with rage and always looking for an opportunity to gang up on a smaller, weaker opponent. Partnering with the mainstream press, liberal Democrats have often been able to convince large blocks of voters to believe all of these things. But recent events are illuminating the absolute hypocrisy of these self-proclaimed peace-loving protectors of American freedom for the little guy. The lack of mainstream media coverage of these happenings shines an even brighter light on the obvious bias of the "4th branch" of government. Senator Chris Dodd (D-CT) recently introduced a bill to reform America's entire financial system. He and his Democrat colleagues have often blamed the entire financial crisis on a lack of regulation spawned by big business' ties with President Bush and other Republicans. Goldman Sachs took billions in bailout bucks from the American taxpayer in 2008. You know...one of those firms that was just too big to fail. But it wasn't Republicans who benefited from the generous political donations of Goldman's people. It was President Obama who received nearly $1 million as the company crumbled. You might expect that to make the news. Something along the lines of "Obama Coffers Filled by Bailed Out Financial Giant." But don't hold your breath. Lachlan Markay at Newsbusters points out that Time and Newsweek were quick to tie President Bush to the failed energy company Enron when it failed. Bush's ~$150,000 in contributions paled in comparison to Obama's Goldman take. Obama hauled in nearly 7 times as much from Goldman as Bush took from Enron. Liberals screamed as if their fingernails were being pulled out when they learned the Bush administration was (gasp!) listening in on phone calls between overseas terrorists and their contacts in the US. They acted as if the former President had dropped the US Constitution in the shredder when he set up a prison camp for captured terrorists on a remote base in Cuba. But Democrats and conservatives usually agree the 1st Amendment protections guaranteed in the Bill of Rights are essential and must be preserved. At least, that's what they all say. So when the TEA Party started gaining momentum, and Democrat politicians began labeling us un-American, we conservatives were somewhat taken aback. But even Obama's own backers were upset this week when, not once but twice, the President appeared upset by gay rights activists protesting his failure to drop the US military's Don't Ask, Don't Tell policy. Obama challenged the hecklers who want the policy changed immediately. Apparently quite perturbed by their protest, the President yelled, "Barbara and I are supportive of repealing Don't Ask, Don't Tell. So I don't know why you're hollering!" Only a few days later, gay rights activists dressed in military uniforms chained themselves to the fence in front of the White House to draw attention to the President's unkept promise to end the policy. When reporters approached to interview the protesters and cover the story, they were forced to retreat by police officers. So it appears the President and his liberal supporters only value the constitutional rights of those who agree with their positions 100% of the time. Obama seems to believe those who disagree should keep their mouths shut and have no real right to voice their opinion. Even the mainstream press, arguably his biggest ally in the 2008 campaign and these first 15 months of his tenure, loses their freedom to cover a story that might stain the President's image with his supporters. And of course you'll recall the demagoguery of the TEA Party protesters in Washington by Democrat congressmen the day the Socialist sheep in jackass clothing voted to drive the final nail in the coffin of the world's greatest health care system. Charges of racism and homophobia were leveled by these elected officials based on their "claims" that protesters hurled racial and anti-gay epithets at black congressmen and Barney Frank. The mainstream media, always a stalwart ally of the liberal left, ran with the story on the word of these Socialist snakes without a shred of evidence. What the Democrat allies in the press didn't tell the world was that Andrew Breitbart of BigGovernment.com offered $100,000 to anyone with video evidence to back up the claims of the congressmen. None materialized. In a literal sea of protesters packing video cameras, and the congressmen recording the entire event on their own phones and cameras, not even a few seconds of a lone protester were produced to exchange for $100K. This leads me to believe the entire act was scripted and staged by these ruling Democrats for no other reason than to delegitamize the movement that drew such a large and vociferous crowd to oppose the crowned jewel of the Obama platform. Nancy Pelosi and her Democrat underlings rarely, if ever, enter the Capitol via the front steps. They pranced through the disgruntled crowd hoping to incite them to violence. And when that didn't work, they just lied about it. The entire debacle was nothing more than a Democrat attempt to undermine the 1st Amendment rights of the opponents of the health care takeover. Pelosi and her pals hoped to instill the fear of being labeled a racist and/or homophobe in the hearts of concerned conservative American citizens for no other reason than to intimidate them into not participating in the rallies. Now for perhaps the most egregious hypocritical hype from the loons on the left recently. The Obama administration and other liberal Democrats have been trying to paint conservatives who oppose the President's march to a Socialist America as violent and dangerous. They've tried hard to link them to militia groups planning to overthrow the US government. But the only violence at TEA Parties thus far has been perpetrated by liberal counter protesters. In St. Louis, SEIU thugs beat down a black TEA Party protester. Last month, more SEIU thugs tried to misdirect conservatives headed for the kickoff of the Tea Party Express III tour in Harry Reid's hometown of Searchlight, NV. When Breitbart stopped, thinking he had arrived at the TPX rally, he found himself amid a throng of SEIU goons who threatened him with violence when he attempted to question them. Most recently, when the Southern Republican Leadership Conference gathered in New Orleans, the most violent of these liberal attacks occurred. Republican Louisiana Governor Bobby Jindal's top fundraiser, Allee Bautsch and her boyfriend were savagely attacked when they left an event at Brennan's Restaurant in New Orleans. Bautsch's leg was broken in four places and her boyfriend suffered a concussion. Liberal protesters who apparently didn't believe conservatives have a right to hold conferences in New Orleans had gathered outside the restaurant as the fundraiser went on. It's been reported that conservatives (and even some patrons of the restaurant who weren't with the party) suffered verbal attacks much worse than those the Democrats accused conservatives of as they left the restaurant. And now it's come to light that what set the attackers off were "Palin pins" worn by Bautsch and her boyfriend. A young woman and her boyfriend viciously attacked for their support of a conservative icon while Democrats consistently claim conservatives are prone to violence? You'd think everyone in the US would have heard of it by now. But no, the Democrat allies in the mainstream media won't tell this story. Contrary to what you see in the MSM, big business is pumping piles of cash into the pockets of liberal Democrats to buy influence and favors. Those seeking to restrict constitutional freedoms wear the brand of the jackass. And the blood on the streets is spilled by the hands of left wing liberals. Posted by Bill Smith : Post Link --> 7:18 PM 0 Comments - Share Yours! by Rep. John Boehner, House Republican Leader: We cannot restore confidence in our economy unless we fully address the root causes of the financial crisis and take definitive steps to ensure that taxpayers are never again forced to pick up the tab for bad bets on Wall Street. The legislation President Obama is promoting, however, does neither of these things and actually makes matters worse. President Obama talks a big game when it comes to Wall Street, but his newest job-killing initiative would provide the nation’s largest financial firms with permanent bailouts ordered and overseen by unelected federal bureaucrats. Under his proposal, the largest Wall Street firms would become eligible for special treatment, including taxpayer-funded resources unavailable to smaller financial firms. These include exclusive access to a pre-existing bailout fund, a Treasury-backed line of credit and a government guarantee for any debt. Such perks will benefit the likes of Goldman Sachs, President Obama’s top financial contributor during the 2008 campaign and a firm that just happens to be under investigation by the SEC for defrauding investors. The decision to designate Goldman and other giant banks as “too big to fail” won’t be made by taxpayers or their elected representatives. Under the Democrats’ plan, a new “Financial Stability Oversight Council” made up of unelected federal bureaucrats including representatives from the Treasury Department, the Federal Reserve, the CFTC, the FDIC and the SEC would have absolute power to seize any company and do whatever it wants with it. This special treatment makes these large firms more attractive to investors than the smaller local banks, widening the gap between Wall Street and Main Street. Local banks will receive none of the perks of the Democrats’ permanent bailout bill while being forced to comply with all of its expensive, job-killing mandates at the worst possible time for small businesses across America. Of course, the large banks won’t mind having their borrowing costs permanently lowered by government intervention. That is exactly how it was with Fannie Mae and Freddie Mac, the government mortgage companies that kicked off the crisis by giving high-risk loans to people who couldn’t afford them. Hoping to meet ambitious growth targets and reap considerable bonuses, Fannie and Freddie executives doubled down on their junk mortgage bet by investing heavily in the derivatives market, sparking a systemwide meltdown. But don’t go looking through this 1,408-page bill that President Obama supports for any provisions that would reform Fannie and Freddie or get the derivatives market in order. This is unfortunate, but unsurprising: Washington Democrats have been enabling these government mortgage companies for years, giving them a free ride while the economy crumbled. What’s worse, this legislation claims that it will fix derivatives, but in reality it will just end up sending this business overseas, hurting our economy and failing to fix the real problems. How can President Obama credibly argue that he has acted to prevent the next crisis when he won’t lift a finger to address the root causes of the last one? Americans are right to be scared to death by the prospect of more open-ended bailouts for Wall Street. After all, our national debt ($12.7 trillion today) is on track to exceed the size of our entire economy (about $15 trillion) in just two years. Permanent, unending bailouts for President Obama’s Wall Street allies and more job-killing mandates for Main Street is not reform. Republicans are standing with the American people by putting forward a responsible plan to end the bailouts, reform Fannie Mae and Freddie Mac, and hold Wall Street accountable for its actions. 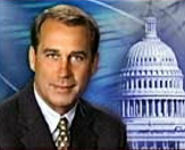 John Boehner, R-Ohio, serves as minority leader in the House of Representatives. The above article was furnished by GOP House Leaders Press Office and was published in Investor's Business Daily. Tags: US House, John Boehner, financial bailout, TARP forever, Wall Street, socialism, government takeovers, H/T ARRA News Service. By Nick D'Orazio, III and Nick D'Orazio, Jr., BulletPeople.com: If only the government passed a law to make sure that those people who can not afford an Apple iPad do not suffer the unfairness and indignity of living without access to tablet computing. 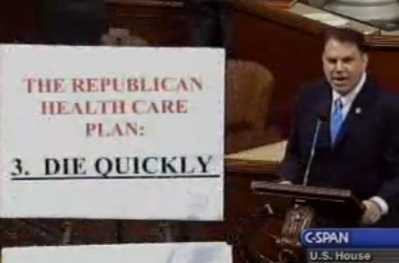 Steve Jobs introduces the iPad and Barack Obama signs a health care law only days apart. Maybe the proximity of these two will remind the voters what a real game changer looks like. Posted by Bill Smith : Post Link --> 10:09 PM 0 Comments - Share Yours! by Gary Bauer, Contributing Author: Democrats in the House and Senate are gearing up for a major push to advance their radical agenda while they still have an overwhelming advantage on Capitol Hill. Last week, Roll Call reported that House Democrats plan to pass a major homosexual rights bill called ENDA by May. Reuters notes that cap and trade legislation will be unveiled in the Senate by the end of month, and Politico reports that Speaker Nancy Pelosi and Senate Democrat Leader Harry Reid met late yesterday and agreed to bring up an amnesty bill for illegal immigrants this year. Each issue is a priority of the far Left. The Employment Non-Discrimination Act (ENDA) elevates homosexual behavior to the same protected legal status as race and religion. Business owners and institutions that adhere to Judeo-Christian values will be forced to compromise their beliefs if this legislation passes. And this year, Democrats have taken their extremism to a new level by including special protections for transgenderism and gender identity – whatever those are. With unemployment hovering near 10% and out-of-control deficit spending, why is appeasing the militant homosexual movement so high on the Democrats’ “to do” list? If that radical assault on our values wasn’t bad enough, Obama’s allies in the Senate, led by Massachusetts liberal John Kerry, are pushing legislation to tax and regulate carbon. We live in a carbon-based economy, so when you hear “carbon,” think energy. Democrats want to tax and regulate energy production. Think about everything you do in the course of a day that requires energy in any form. How many of you flip a light switch first thing in the morning? Do you drive to work? Use a computer or other machines? Do you like air condition in the summer? All of it will be taxed more if the Left gets its way. If you thought unemployment was bad now, wait until this massive job-killing tax hike leads to $7.00 a gallon gas. With unemployment so high, there’s no shortage of workers – there’s a shortage of jobs. This is not the time to legalize millions of illegal aliens. But Obama and his allies may well need millions of new voters as the country turns against their radical agenda. Posted by Bill Smith : Post Link --> 8:35 PM 0 Comments - Share Yours! by Marc A. Thiessen, Contributing Author: Can an unborn child feel pain? That question will dominate the abortion debate in America for the next several years thanks to Gov. Dave Heineman of Nebraska. Last week, Heineman signed the Pain Capable Unborn Child Protection Act into law, banning abortions in Nebraska at and after 20 weeks based on growing scientific evidence that an unborn child at that age can feel pain. In 1973, when Roe was decided, it was believed that the nervous systems of even newborn babies were too immature to feel pain -- so doctors generally did not provide anesthesia to infants before surgery. But 25 years ago, a young doctor at Oxford University named Kanwaljeet Anand noticed that babies coming to his neonatal intensive care unit from surgery suffered a massive stress response -- indicating they had been through extreme pain. His research into this phenomenon shifted medical opinion, and today even the most premature newborns are given anesthesia to alleviate pain during surgery. Anand -- now a professor at the University of Arkansas and a pediatrician at the Arkansas Children's Hospital -- continued his research into infant pain, which has led him to conclude that fetuses can feel pain at 20 weeks, and possibly as early as 17 weeks when a portion of the brain called the "subplate zone" is formed. Indeed, according to a New York Times Magazine story on Anand's research, a fetus's "immature physiology may well make it more sensitive to pain, not less: The body's mechanisms for inhibiting pain and making it more bearable do not become active until after birth." Other medical experts share Anand's assessment. Jean Wright, executive director and vice president of operations for Children's Hospital and the Women's Health Institute at Memorial Health University Medical Center in Savannah, Ga., has testified before Congress that an "unborn fetus after 20 weeks of gestation, has all the prerequisite anatomy, physiology, hormones, neurotransmitters, and electrical current to 'close the loop' and create the conditions needed to perceive pain. In a fashion similar to explaining the electrical wiring to a new house, we would explain that the circuit is complete from skin to brain and back." Not everyone in the medical community agrees. Just as there were skeptics about newborn pain a quarter-century ago, there are skeptics of fetal pain today -- and these views will be aired as the legal battle unfolds. But regardless of the legal outcome, a national discussion on the topic of "fetal pain" can only help the pro-life movement. A Gallup poll last year found that, for the first time, more Americans called themselves "pro-life" than "pro-choice" by a margin of 51 percent to 42 percent. In 1995, the numbers were more than reversed: Fifty-six percent of Americans said they were "pro-choice" and just 33 percent said they were "pro-life." How did the pro-life position gain 18 percentage points in just 15 years? For one thing, scientific advances have allowed us to see inside the womb as never before. Once-experimental medical procedures, such as fetal surgery to repair spina bifida, have become increasingly common. And a 1999 photo of baby Samuel Armas, then at 21 weeks gestation, reaching out of his mother's womb and holding his doctor's finger touched millions of hearts around the world. People have been able to witness with their own eyes the humanity of the unborn child. As this window into the womb was opening, the pro-choice movement was busy defending the gruesome practice of "partial birth" abortion. A ban on the practice was upheld by the Supreme Court in 2007. Now, thanks to the people of Nebraska, the national debate will shift to the topic of "fetal pain," which once again underscores the humanity of the unborn. As this debate unfolds, science will continue to advance, allowing us to see -- and save -- babies at earlier and earlier periods of gestation. And the consensus will continue to grow that pre-born babies are indeed human beings, deserving of our love, our compassion and, most important, our protection. Marc A. Thiessen is a conservative National Security / Public Policy Expert. He submitted this article to the ARRA News Service Editor which also appeared in his weekly column in The Washington Post. Thiessen is the author of The New York Times Best Selling Book - COURTING DISASTER: How the CIA Kept America Safe and How Barack Obama is Inviting The Next Attack. Thiessen is a visiting fellow at both the American Enterprise Institute and the Hoover Institution, former member of the White House Senior Staff, and chief speechwriter to President George W. Bush and Secretary of Defense Donald Rumsfeld. Posted by Bill Smith : Post Link --> 8:40 PM 0 Comments - Share Yours! Tags: William Warren, political cartoon, ObamaCare, rotten egg, government health care H/T ARRA News Service. Posted by Bill Smith : Post Link --> 3:52 PM 0 Comments - Share Yours! by Adam Bitely: News broke this morning that Charlie Crist, establishment candidate for U.S. Senate in Florida, has pulled all of his T.V. ads off the air. This can mean a couple of things such as campaign funds have dried up--but more likely is that he will soon be dropping out. The blogosphere is going crazy with theories. But the biggest guessing game right now is whether or not he will run as an independent. Rumor has it that he will not, and rumor also has it that he will. Bill Wilson, President of Americans for Limited Government said, "This is the best example of how toxic it is for establishment candidates. Crist may be the first of many to meet this end." Posted by Bill Smith : Post Link --> 12:37 PM 0 Comments - Share Yours! CBS: Will Charlie Crist Run as an Independent? CQ Politics: Wanna Be Charlie's Chairman? Posted by Bill Smith : Post Link --> 4:07 PM 1 Comments - Share Yours! Here’s a great chance to use the liberals’ own tools against them. Rock the Vote was started to register young voters to promote the liberal agenda. But they’ve created a free tool that anyone can use to help register voters. So I signed up to give it a try. Just click on the Rock the Vote image and it will take you to a web form asking for all the pertinent information to register to vote. After you've completed the web forms, you'll be able to download, print, and sign a completed voter registration form. Then you'll need to mail in the form to address provided. Once you complete these simple steps, you're registered to vote! You can also sign up for text messages reminding you when and where to vote. Please encourage all your friends and family to make sure they’re registered so they can help us take this country back! And it’s an extra special bonus to know we’re using the liberals’ own tools against them. Posted by John M. Allison III : Post Link --> 12:41 AM 0 Comments - Share Yours! Erick Erickson at Red State is addressing signals from the Charlie Crist campaign. If Erik's review of Christ' signals are true, it will mean that Crist is unwilling to accept the decision of his Republican Party if he looses in the Primary or even quits before the Primary. Christ would indeed then evidence that he is a RINO seeking to go to Congress. by Erick Erickson: Florida political pundits have been saying for a few weeks that if Charlie Crist vetoed a Republican backed measure pushed heavily by Jeb Bush to reform Florida public education, it would be a strong sign Charlie Crist would bolt the GOP. Well, Crist vetoed it. The legislation would have made it easier to remove bad teachers and was heavily opposed by teachers unions. Crist chose to side with teachers unions rather than the parents groups that wanted the new law to improve teacher performance. Now Crist’s campaign chairman is bolting. Former Senator Connie Mack rode through the storm with Crist and is using the veto of this legislation as his excuse to get out while the getting is good. I find it hard to believe this of all thing would be the straw that broke Connie’s back. Maybe Crist really is going independent. Posted by Bill Smith : Post Link --> 2:50 PM 0 Comments - Share Yours! Bill Smith, ARRA Editor: My mother used to quote as teenager Bill headed out the door, "Be Good, remember your sins will find you out." Of course, I grew up in the days when many Bible verses were embedded in the common conversation of people. Tomorrow, across the nation, citizens will gather together at TEA Parties. The influence of this grassroots effort has been blessed and continued to grow since it began a year ago. Even noted celebrities, or at least conservative celebrities, now make a serious attempt to be at or aligned with the TEA Party events and the message. Politicians on both sides of the isle have taken note. Some favor the efforts while others fear the efforts. And the liberal progressive democrat leadership in Washington, D.C despise "We The People." Liberals who in years past have been active in grassroots efforts, maybe not so large but definitely more violent, hate the TEA Party movement. They skipped right over envy and have gone directly to hate. Others are fueled by the liberal media who verbally attack and accuse anything conservative as being hateful and racist even when the conservatives are black or some ethnicity other than "blanco." And progressive socialists and their minions hate the fact that over half of the Tea Party members are Democrats and Independents many of whom are tired of the DNC and the marxist-sociopaths that have "forgotten" the United States Constitution. Over the last week, conservative activists online have thoroughly exposed the loser behind an Internet call to "Crash the Tea Party." His name is Jason Levin. To follow his trail, check Free Republic here, Canada Free Press here, and Velvet Hammer here. After failing to cover his tracks, Levin is now basking in the glow of attention on his tpartycrasher Twitter page and on his personal Twitter page (where he brags that he has hit the big time and “gone viral:”). . .
Before them, it was Craig Varoga — a shady Democrat political operative and overseer of a convoluted, money-shuffling web of 527s. He launched "TheTeaPartyisOver.org” in January to target Republicans who supported the Tea Party movement and to prevent the "radical" and “dangerous” fiscal accountability agenda from “gaining legislative traction." The founder of the CrashTheTeaParty.org, Jason Levin, is under investigation by his employer. Interestingly, this character has been exaggerating his job, among other things. He actually works in the media lab at Conestoga Middle School in Portland, Oregon. Levin claimed in an interview with Talking Points Memo that he was a technology consultant. Apparently he is a public toad now facing an investigation for abusing the taxpayer dollar to organize his anti-Tea Party efforts. Levin, who sought to demonize Tea Partiers by placing faux tea party activists at rallies across the nation that would portray the tea partiers as bigots and homophobes, has seemed to land himself in a great deal of trouble. Not only does the Tea Party movement gain more credibility because of this bozo, Levin may now find himself out of work. Also, please enjoy the image of Jason Levin in his Star Wars outfit. Hat Tip to UnCoverage.net. Jason Levin is dressed in the wrong Star Wars outfit unless his intent even in this garb signals his intent to infiltrate the good side. He should have dressed as a brainless storm trooper. My mother would say today based on the above article that Jason's sins (devious behavior - Is he using public school time and money?) have found him out. So, tomorrow attend your TEA Party and shout and cheer. Be aware of potential infiltrators but don't fear. If you read this about Jason Levin before going, take time to remark that TEA Party Crashers like Jason Levin are full of Pelosi! Hat Tip ARRA News Service. Yesterday's special election in Florida's 19th Congressional District did not go as conservatives hoped. Florida Democrat State Sen. Ted Deutch won Tuesday's special election to replace retiring Democrat U.S. Rep. Robert Wexler. With 100% of precincts reporting, Deutch had 62% of the vote; Republican Ed Lynch had 35% and independent Jim McCormick had 3%. Lynch did well in a district where democrats outnumber republicans by over 2-to-1 — 234,000 to about 111,000. The district voted about 65% for Obama in 2008 and 66% for John Kerry in 2004. Deutch raised $1.35 million while Lynch raised $103,000. Wexler, a self-proclaimed "fire-breathing liberal," left office in January during his seventh congressional term to become president of the Washington-based Center for Middle East Peace and Economic Cooperation. Wexler endorsed Deutch who will now serve the remaining eight months of Wexler's term and then will have to run in November for re-election. Wexler has probably already planning a paid visit for Sen. Deutch to meet some anti-Israeli Arabs in the middle-East. America's Best Choice talked with the Ed Lynch campaign office today. At present, Lynch has not decided if he will file for the general election. He and his supporters will over the next few weeks evaluate and and consider the options. It should be noted that while Deutch raised $1.35 million to Lynch $103,000; the return on the dollars invested in Lynch had a greater return per voter. In addition the Dems had to consume 13 times the amount of Lynch's campaign - $1.35 million - to retain the seat and to be able to gain entry into the general election. Based on the numbers, Deutch should have won by 66% but only garnered 62%. his indicates that Democrat vote is starting to erode even in this most liberal of voting district in Florida. Also. if a independent had not run, Lynch would have pulled 38% verses 35%. Both of which are significant numbers demographics and dollars spent in this district. Thanks for running Ed Lynch! As for you Democrats in the Florida 19th District who voted for Deutch, we hope you wake up miserable in the coming days as you realize you and your children and children's children are going to suffer from the tax and spend liberal you sent to Congress to represent your district. Ted Deutch will now join Nancy Pelosi, Harry Reid, and Barack Obama in their continued assault on America freedom and liberty. Tomorrow is Tax Day, Earth Day and thank goodness for those opposed to all these taxes: a self-proclaimed TEA Party Day. The Obama Administration's spending in the past year has been unprecedented and Tax Day won't come and go quietly. In just over a year, Democrats in Washington have proposed trillions of dollars in new taxes on American Families -- and passed hundreds of billions in new taxes to pay for their government takeover of our health care. These new taxes affect you and your family -- every day. Posted from the ARRA News Service. Posted by Bill Smith : Post Link --> 3:17 PM 0 Comments - Share Yours! by Javier Manjarres: The 2010 Southern Republican Leadership Convention (SRLC) in New Orleans featured a star-studded line up of prominent Republican politcos, headlined by former Governor Sarah Palin. Palin’s speech was well received, but it was what she said immediately afterwards that was most newsworthy. Suffice to say, big media missed out on what exactly she said- but the exclusive story could not escape the jaws of the Shark Tank! Could this be the end of the road for Charlie? Other Conservative leaders are lining up behind Rubio including, the lovable little fuzzball himself, Rush ’El Rushbo’ Limbaugh. Several months back, I ran into Rush and he expressed to me how much he liked Rubio and that he was rooting for him. Since then, Rush has gone on the radio to call Rubio ‘Reaganesque’ and tout him while describing Charlie Crist as your typical RINO. Sarah Palin was her usual perky, chatty self, offering her trademarked ‘ you betcha” in expressing her support for Rubio, blown kiss and all. My only question is, to whom did she blow the kiss to, me or Marco? Sorry Marco, this question is a given, better luck next time. Posted by Bill Smith : Post Link --> 5:07 PM 1 Comments - Share Yours! Rasmussen Reports (4/12/2010) Support for Florida Governor Charlie Crist’s U.S. Senate bid has fallen this month to its lowest level yet. Just 28% of the state’s likely Republican voters support his candidacy now, down six points from March. House Speaker Marco Rubio edging up a point from last month to 57%, his highest level of support to date. Three percent (3%) like some other candidate in the race, and 12% are undecided. Republican Primary voters see Rubio as a stronger candidate than Crist in the General Election. Eighty-one percent (81%) say Rubio would be at least Somewhat Likely to win if nominated while just 63% say the same of Crist. Both Crist and Rubio with a double-digit lead over their likely Democratic opponent, Congressman Kendrick Meek. Crist, an early favorite in the race, was the choice of the party establishment but angered conservatives when he was one of the few Republicans to endorse President Obama’s $787-billion economic stimulus plan. Rubio, initially a long-shot contender, was embraced by the Tea Party movement, and Crist’s support has been falling ever since. Posted by Bill Smith : Post Link --> 1:38 PM 0 Comments - Share Yours! Bill Smith, ARRA Editor: I like Herman Cain. He is such a breath of fresh air and I could listen to him for hours. He came by to visit with bloggers in the media center before he spoke to a packed house at the Southern Republican Leadership Conference. Many of you know that Herman Cain is a noted speaker and radio show personality. I along with many others gathered to listen to fellow bloggers ask him questions and to Herman's response, wit and wisdom. As much as I wanted time with Herman, I did not expect to get the opportunity. Then as people began to back away, I noted him hesitate and instead of leaving, turned toward me. I reached out my hand and introduced myself and got to shake hands with a man I admire. It was also amazing that people gave us space and we shared various thoughts and comments and I answered a couple of his questions. As we parted, we shook hands again and grasped each others arms like two parting friendly co-laborers. I leaned in and asked him one more personal question, " Are you going to run again for office" (I meant for Congress). He smiled, and said, "there is only one race I would be interested in." I said do you mean you would run for President. He smiled, shook his head and we parted company. He was then escorted to the main convention hall where he was to be an unscheduled special speaker. In the media room, we were able to watch speakers on a large screen TV. But, we could also go to the convention hall to listen to the speakers from a designated media area. I decided that I wanted to not only hear Cain, but I also wanted to gauge the reaction of the delegates and guests attending the SRLC. Unlike most speakers who get varied applause, Herman Cain brings people to their feet like a scoring team brings the fans to their feet -- Shouting, cheering, clapping and often laughing. And, at the SRLC, Cain scored big time. Below, You can hear his comments and gauge the reaction of the people in the video of his speech (talk with the people). Be sure to listen to the end to hear Herman Cain hint of his involvement in 2012. To share or post to your site, please mention / link to the ARRA News Service. Thanks! Posted by Bill Smith : Post Link --> 10:25 AM 0 Comments - Share Yours! Yesterday, The Washington Post wrote, "he debt crisis that has taken root in Greece, sparking an investor panic and talk of a national default in the heart of Europe, is at the leading edge of a problem expected to roll through the economically developed world as government borrowing rises into uncharted territory. This mounting government debt poses a painful choice for developed countries such as Britain, Japan and the United States: either a deep reordering of public expectations about everything from the retirement age to tax rates, or slower growth as record levels of borrowing crimp economic activity. Economists at the International Monetary Fund project that the amount of government debt held in the world’s advanced economies will soon be so great that it surpasses the value of what they produce in a year." The Post noted "In the United States, where the federal government's debt has reached 84% of GDP, Federal Reserve Chairman Ben S. Bernanke spelled out the risks in a speech this week calling for restraint of public spending on entitlement programs." These warnings from the Fed chair and the IMF come only a couple weeks after President Obama signed into law a massive expansion of entitlement spending in the form of his $2.6 trillion health care takeover, which both the CBO and the administration’s own actuary at the Centers for Medicare and Medicaid Services have said will increase government health expenditures. CBO estimated an increase in health spending of $210 billion over the next decade, while CMS estimated a $222 billion increase over the same period. Looking at this mountain of debt and the increase in our obligations thanks to the health care bill, the publisher of the Las Vegas Review-Journal declares today that "Harry Reid and friends turned us into Greece." He adds, "The Obama/Reid/Pelosi policies are poised to financially swamp us as a nation." On Thursday, the CBO released its Monthly Budget Review for February and announced that "[t]he federal government incurred a budget deficit of $714 billion in the first six months of fiscal year 2010 . . . ." Washington Post columnist Robert Samuelson noted recently, "Two weeks before the House vote [on health care], the Congressional Budget Office released its estimate of Obama’s budget, including its health-care program. From 2011 to 2020, the cumulative deficit is almost $10 trillion. Adding 2009 and 2010, the total rises to $12.7 trillion. In 2020, the projected annual deficit is $1.25 trillion, equal to 5.6% of the economy (gross domestic product). That assumes economic recovery, with unemployment at 5%. Spending is almost 30% higher than taxes. Total debt held by the public rises from 40% of GDP in 2008 to 90% in 2020, close to its post-World War II peak." As Samuelson said, "Should the United States someday suffer a budget crisis, it will be hard not to conclude that Obama and his allies sowed the seeds, because they ignored conspicuous warnings. A further irony will not escape historians. For two years, Obama and members of Congress have angrily blamed the shortsightedness and selfishness of bankers and rating agencies for causing the recent financial crisis. The president and his supporters, historians will note, were equally shortsighted and self-centered -- though their quest was for political glory, not financial gain." To post to your site, click on "Post Link". Hat Tip ARRA News Service. Posted by Bill Smith : Post Link --> 2:21 PM 0 Comments - Share Yours! Florida Tea Party Live: On Thursday, April 8th, 2010, Congressman Alan Grayson, Democrat in Florida’s 8th district, interrupted a district meeting of the local Orange County Republican Executive Committee. The meeting was being held at Perkins, a family restaurant. Congrerssman Alan Grayson said, “There are 308 million people that pay my salary. Do you know what that breaks down to per person?” After Tom shrugged his shoulders insinuating ‘I don’t know’, Grayson repeatd the question with emphasis. Tom quickly replied, “I have no idea”. ”It’s pennies on the dollar”, said Grayson. He later said, “I took a pay cut when I took this job”. Grayson threatened Falconer by saying that he’ll spend thousands of dollars making sure he doesn’t get elected. Question: Is it legal or atleast unethical for a sitting congressman to threaten to influence a local election? Why is Matt Falconer, running for local Mayor, even on the radar of Alan Grayson? Posted by Bill Smith : Post Link --> 1:12 PM 0 Comments - Share Yours! In 2006, Charlie Crist talks to Rudy Giuliani while running for governor. In 2008, Giuliani didn’t get Crist’s backing. Back in 2007 and early 2008, Rudy Giuliani spent so much time campaigning for president in Florida he was like a houseguest who wouldn't leave. And a big part of Giuliani's Florida-is-everything strategy was the expectation that super popular Gov. Charlie Crist would endorse him. That never happened, of course, as Crist not only pulled the endorsement Giuliani had banked on, but threw his support to John McCain just before Florida's crucial GOP presidential primary. Posted by Bill Smith : Post Link --> 11:01 PM 1 Comments - Share Yours! On April 13th, a special election will be held in Florida's 19th Congressional District. The special election was created by the resignation of Democrat Congressman Robert Wexler who resigned on Jan 3, 2010 to become president of the Washington-based Center for Middle East Peace and Economic Cooperation. Wexlar was just another liberal congressman throwing his constituents overboard to secure a cushy job before getting booted from office in November 2010. Wexler, a moonbat who wanted to impeach Bush and Cheney, is now president of an org that funds trips for members of Congress and government officials to meet with Middle East leaders. Their stated goal is to encourage the "peaceful resolution" to the "Arab-Israeli conflict." Wonder if Wexler realizes the majority of Muslims opposed to Israel in the Middle East are not Arabs. South Florida now has the opportunity to send a voice of the people to Washington, D.C. and to keep that voice there in the Nov 2010 election. The present race is between Edward Lynch, a Republican conservative, and Ted Deutch, a proven liberal Democrat who has been avoiding numerous public appearances with Ed Lynch. The independent South Florida Tea Party is an organization that neither supports nor opposes candidates for public office. However, they track the positions of candidates on issues, and they have issued a "Candidate Report Card" for the special election. Based on a questionnaire, public records, and responses in newspapers and debates, they awarded grades to the two candidates. Ted Deutch (D) received a grade of "F" for being less than 60% willing to vote in agreement with his would be constituents values. Ed Lynch (R) received a grade of "A" for evidencing over 90% of the time that he would vote in line with the values of people of his district. Deutch identified that he would have supported the liberal agenda of "cap-and-trade bill,the carbon tax,the health care reform bill." Ed Lynch has opposed and would oppose these bills. Ed Lynch supports reducing the federal deficit and the size of government, working toward a more equitable tax code, listening to constituents and working to restore trust in government. 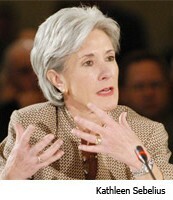 However, Deutch would not respond on these issues. Deutch has been part of the liberal establishment, and he evidently has no interest in changing the agenda of his party's leadership. If elected, Deutch would be ready to vote for Nancy Pelosi to remain Speaker of the House and would be supporting the Obama, Reid, Pelosi agenda. After reviewing the South Florida Tea Party independent Candidate Report Card and reading the endorsements of Ed Lynch by our friend Major General Paul. E. Vallely, U.S. Army (Retired), and Brigadier General Jim Cash, USAF (Retired), America's Best Choice hereby endorses Edward Lynch (R) for US Congress to represent Florida District 19. Tags: Endorsement, Florida, US House, US Congress, FL-19, District 19, special election, Edward Lynch, Ted Deutch. Posted by Bill Smith : Post Link --> 7:50 PM 5 Comments - Share Yours! Almost 2000 years ago, the only innocent man to ever walk the Earth arose from the grave after being betrayed by one of his closest friends, humiliated by the public, brutally beaten and executed by the Roman authorities. Now he serves as the intercessor between us and God the Father. He died for my sins, and yours. All he asks in return is that we believe in him. We give thanks for his sacrifice for all of us. And here are a few songs that celebrate his escape from the grave, and our salvation! Posted by John M. Allison III : Post Link --> 10:37 AM 0 Comments - Share Yours!